I bought this chopstick gift set from MSPottery for Pat this Christmas: I was tired of reusing the cheap ones that come with take-out. 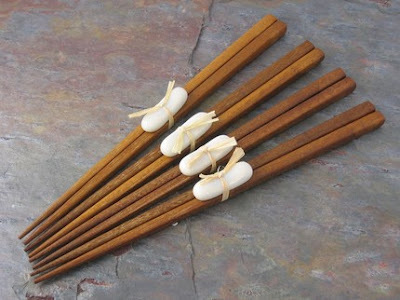 I really liked the look of these chopsticks, and the clean, crisp design of the rests. Luckily, my mom surprised me with a tray holding 3 small dipping sauce dishes - all in white. It all matches perfectly! Tonight, I'm going to crack open my new Thai cooking recipe book and try something new! Chopsticks are one of Japan's most representative object. As they can be purchased in set of two sizes or individually, it is very convenient and they will fit anybody's hand. These personalized chopsticks are a great gift from Japan since they are unique and truly traditionally made.